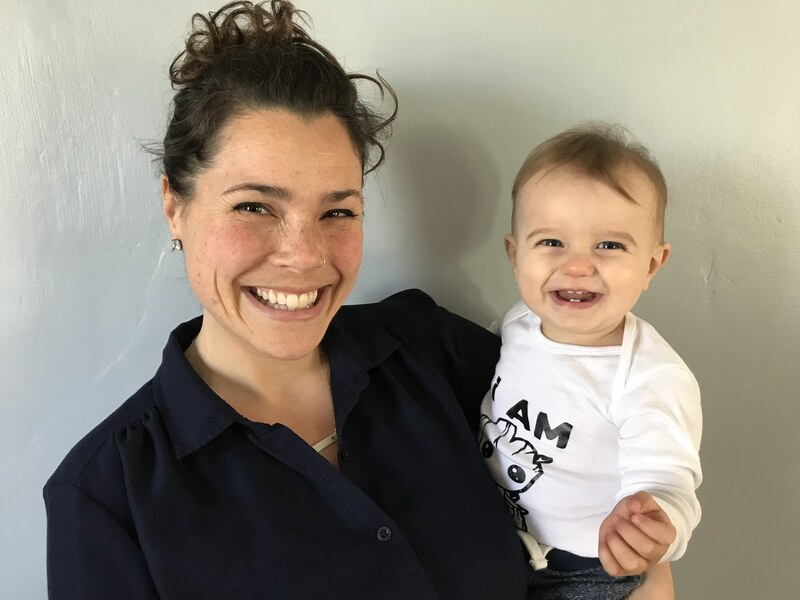 Nova Quinn, CCC-SLP, began hearing about teletherapy while attending graduate school in San Francisco. She moved to Providence, Rhode Island after graduation in 2012 and started working in a public school five days a week. She was really interested in trying out teletherapy. Because she finished her public school days early at 2 pm Eastern time, she realized she could come home from her onsite therapy, open her computer, and pick up a caseload in Washington or California, to test the teletherapy waters. And it was great. She loved it. Then she got pregnant. When she had her son and was on maternity leave, the public school didn’t have any flexibility—they needed her full time or not at all. Nova made the leap to PresenceLearning in 2017. I wake up in the morning at my home in Rhode Island and have breakfast and coffee with my one-year-old as my husband gets ready and heads out to work. On the two days that I work with PresenceLearning, I spend the morning playing, going for a walk, doing yoga, or squeezing in an extra nap with my baby. My mom or a family friend comes over close to noon and I grab a quick lunch with everyone before heading to my desk to start my work day in Washington State. I open my laptop, put on my headphones, and greet my eHelper and first students. Sometimes I start my Mondays with testing or IEPs, then move on to typical speech therapy sessions. I have a “lunch” break mid-afternoon. I like to use that time to get some tea, give some snuggles, and maybe prep dinner or throw in a load of laundry. I finish up my work day between 6 and 6:30pm, saying goodbye to my final students and recapping or planning with my eHelper. I join my family for dinner and help with bedtime for my son. I usually finish up notes, emails, and report-writing between 8 and 9pm or during my son’s nap time the following afternoon. The flexibility of the schedule attracted me to teletherapy. I started with a small caseload on the West Coast when I had afternoons free while living on the East Coast. Now I have a small baby and love that I can make a schedule that meets the needs of my family. Do you have any recommendations for working moms looking to make the transition to telepractice? I think that it was a remarkably easy transition for me. I feel pretty confident with technology and computers anyway. There were so many opportunities for support and for practice. At times when I didn’t even know that I was going to be unsure of something, someone was already there saying, “Hey in case you’re unsure of this, we’re here to support you in it.” The company has so much practice supporting people. There are so many opportunities for that support so it was a great transition over. I have not felt at all like I am being pushed to take on more than I feel like I can manage. I feel like I can absolutely always say “These are the hours I want and feel like I can fill.” If I want to fill more hours, there are opportunities that come up that I can take on. Nobody’s ever saying, “We need you to do this. We need you to try this. Can you squeeze this in?” I feel like I am my own boss and can take on what I need to. It’s very empowering. It allows me to keep my family’s needs at the center of what I’m doing. It has the best of both worlds…it’s like being an employee and getting all the good things of that, working with a very supportive and successful large company like PresenceLearning, and also being in control and being your own small business as a contractor—it has all the best parts of that too. Do you think you understood what you were getting yourself into when you made the leap from onsite employee to telepractice contractor? The PL training videos for the position were great—they definitely let me know what was coming and what was needed. It can be difficult to figure out each individual state’s school law but PL has excellent support. There’s always more than one person to ask so if I have a question, I can ask three or four people so I can be sure I have a solid answer when it comes to any of the legal issues and documents, and concerns like that. Before PL, I was used to going to work and bringing home all my work on the weekend and doing all the extra time and that was just the job. The big shift for me was I got to bill for all my indirect time. That has been a real benefit. I can say, these progress notes took me 3 hours and I can bill for it. That’s pretty empowering as well. It feels like a very supportive network. Even though I’m working alone from my house, there are tons and tons of supportive professionals I can ask for help and bounce ideas off of. How do you connect with your colleagues when you need ideas? I use the library or I email other speech therapists through PL. I find lots of amazing things already made in the library. It’s like going into a speech room that’s already stocked with supplies which is every speech therapist’s dream come true. I was surprised by how easy the platform is to use, especially the animations that help regain the attention of clients. What Room features are your favorite? I love the animations on the platform. With my preschool kids that was so rewarding for them. I can make that penguin jump 15, 30 times in a session, and every time I elicited the target from them and made that penguin jump, it was so rewarding and they would want to do it again and again. It’s a great way to pull kids back in. I love the memory games. The kids seem to absolutely love the memory games that are so easy to use on the platform. And it blows everyone’s mind that we could be playing Memory together and I’m in Rhode Island and they’re in Washington state. There are so many things you can do with Memory. Once we finish the memory game I allow them to use the stamps. And then they can practice all the skills again by reviewing everything we already did. The platform itself is so interactive and so easy to use, for both me and all the way down to preschooler students who just need a little assist from aides/ primary support people and are so independent, up through middle schoolers that I see. The platform has such simple things that yield good results. I can keep switching out the memory games and there are kids who come every week and ask “Please can we play memory again?” I can figure out how to fit in almost any speech task to that. That’s not something I could have built myself. It’s built into the platform so it’s great. Getting signature pages and original documents from the school district has been a challenge. Can you tell us how you’ve worked through challenges getting documents and signatures from schools? My signature has been needed on progress notes so I just needed to print them out and took them to the post office. Because I was compensated for my time, it wasn’t a problem to do that. Are you interested in joining the PL Care Network? Visit our Careers page to submit your application today! It’s great to see someone else from Rhode Island! I also started in 2017…glad to meet you Nova…. your little boy is so cute! I loved reading about your day as a teletherapist. And I have to say your little one is BEAUTIFUL! I am glad you joined our PL team!! I believe that telrpractice is the way to service in underserved areas. I have as an expert witness used telepractice to test and provide reports for litigation. My name is Cynthia Feierstein, and I’m a speech pathologist. I am interested in learning more about your company and if there are opportunities available. I live in NYC with licens to practice here, NJ, and FL. I can easily get a license in other states. Please let me know when it would be convenient to talk. Thank you in advance for your consideration. Thank you for contacting us. If you haven’t already applied, please submit your application on our website. Simply visit http://www.presencelearning.com/join to fill out the form and upload your resume! Once your resume is received, a recruiter will be in contact with you to schedule a phone interview. Thank you for your interest in PresenceLearning.